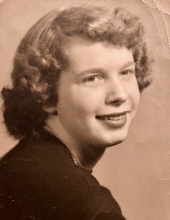 WINSTED – Catherine (Cianci) Dufour, 83, passed away peacefully on Tuesday, Jauuary 15, 2019 on what would have been her 64th wedding anniversary. She was the loving wife of the late Paul Dufour who passed away in August. Born October 11, 1935 in Winsted; the daughter of the late Anthony and Anna (Bartos) Cianci. Catherine was a stay at home mom raising her children, extended family and grandchildren with all her love and kindness. She enjoyed baking, cooking and hosting all the holidays for friends and family alike. She loved crocheting, knitting and gardening both vegetables and flowers. She also enjoyed trips to the casino. She was a huge animal lover as well. Catherine leaves two sons, James Dufour and Eric Dufour, both of Winsted; five daughters, Sharon Dufour of Winsted, Donna (Mark) Medara of Colebrook, Diana Fetzer of Barkhamsted, Laurie (Jim) Freeman of Barkhamsted and Terri (Doug) Kenneson of Colebrook; grandchildren, Abbey Medara, Michael Cesnak, Sarah Freeman, Brett Kenneson, Chelsea Perreault, Taylor Fetzer and Amanda Fetzer; great grandchildren, Braeden, Tristan, Keegan and Xavier; a sister, Dorothy Bombara of Torrington; and extended family. In addition to her husband, she was predeceased by two brothers, Tony and Mike and a sister, Mary. Friends may call on Friday, January 18, 2019 at Montano-Shea Funeral Home, 5 Steele Road, New Hartford from 5 – 7 PM. A Mass of Christian burial will be held on Saturday, January 19, 2019 at Our Lady of Hope Parish (Formerly Immaculate Conception Church) in New Hartford at 11 AM. Burial will be held at Immaculate Conception Cemetery, New Hartford in the spring. Visit an online guestbook at Montano-shea.com. To plant a tree in memory of Catherine (Cianci) Dufour, please visit our Tribute Store. "Email Address" would like to share the life celebration of Catherine (Cianci) Dufour. Click on the "link" to go to share a favorite memory or leave a condolence message for the family.